Map of the family structure in Europe. The game of the four family groups. Map of the family structure in Europe. Europe. Every Friday a special issue dedicated to the European construction. In the «trunk» family we find Germany, Austria, Ireland... In the «communal» family, Tuscany and Finland... Historian and demographer Emmanuel Todd, in a book which appeared yesterday in France, suggests a new distribution of Europe, based on four models of family structure. According to him, the religions and the political systems of an area are directly related to these. Will Europe be Universalist? Respectful of difference? Ethnocentric? Europeans will not be able to define themselves without reaching an agreement on the definition of the Other... I would very much like political Europe to be made on clear bases which acknowledge differences, but deep inside I don’t think that this will happen. A mysterious continent, Europe has no geographical consistency. The Petit Robert defines her as «the smallest and the worst outlined of all continents, constituting an advanced bridgehead of Asia», she breaks away as soon as a historian tries to pull together the threads of her past. Why is it that Protestantism only conquered the countries of northern Europe? Why is it that England became the homeland of industry? Why did France become intoxicated with the blood of Revolution before rejecting that of Nazism and fascism? So many questions which have not found an answer until now. However, perhaps a tip of the veil is about to be lifted. Emmanuel Todd, a historian and demographer, has just published a work –The Invention of Europe1– in which he delivers an especially captivating reading key of the continent history: the family. The thesis –the religious, economical, ideological evolution of a human group is largely conditioned by its anthropological background– is not new. Aristotle, Rousseau, Diderot, to name just a few, were its eager supporters. It has been now several years that a team of British university researchers work on this matter. Emmanuel Todd, himself a graduate from Cambridge for his work on family systems, had already applied this analytical method to France in La Nouvelle France (1988). However, nobody had researched with so much thoroughness and application (a work of seven years and a mine of information often unknown) the relationship between the values supported by the family and the social behaviour of European ethnic groups or peoples along the last five centuries. Far from the lyrical outbursts of Braudel’s disciples, Todd leads us into the European labyrinth with Ariadne’s thread in his hand: the diversity of the family grounds is the cause of the diversity of the continent. Some peoples become inflamed with the Reformation, others with the French Revolution; some ethnic groups veer towards nationalism, others profess socialism; some areas are in the front line for literacy campaigns and industrialisation but are scared by birth control or the universal suffrage... All of this, Todd assures us, depends only from the family culture. The demonstration –supported by eighty files– apparently shows no fault. It is so perfect, however, that it makes you doubt. Hasn’t the author walked into a double trap? Hasn’t he seen a cause where perhaps there is only a correlation? By opposing the religious variable to the family one in order to explain «the differentiation and segmentation process»of the continental west, he has won a chain link. However, has he gone up the whole chain? These comments however should not ruin our pleasure of enjoying (sometimes with some bewilderment) this most achieved exercise in synthesis. Neither should it stop us from playing the four families game, as he invites us to do. The Paris area, centre and south-eastern Spain, centre of Portugal, north western Italy, with extension to Provence, Mezzogiorno (southern Italy) and Sicily, and Romansh Switzerland. The couple has children which, on becoming adults, establish independent homes. The family never develops beyond the parents-children nucleus, and this model contributes to develop individualism. With respect to the parents’ properties, they are distributed in a fair, meticulous manner among the descendants. This develops a very strong feeling towards the idea of equality. Freedom and equality. These are two issues dear to a Revolution which started in the Paris area and had to fight hard with the other French areas governed by other family values: Occitany, Brittany, the North and Alsace. But the «universalist quintessence» of France is far from being accepted by the other Europe, including the areas which share the same family system. In the areas where small property is the rule, religion (Catholic, except in the Romansh Switzerland, which stays under the influence of Berne) remains very much alive until the middle of the 20th century. Since God refuses to surrender in the presence of the great modern ideologies, these areas will produce what Todd calls the Christian Republicanism. Loraine and the Franche-Comté do not follow the ideals of Revolution, but all the same will support the 3rd Republic, equalitarian, in spite of the pope’s sermons. On the contrary, the provinces where the great exploitation is pre-eminent will suffer in the first place (1730 to 1800) the phenomenon of dechristianization. Free from the Creator they will choose to the right liberal-militarism, and to the left anarcho-socialism. In its French version, the liberal-militarism gave birth to Bonapartism and to Boulangism, two authoritarian movements which extolled discipline and hierarchy, but were unable to get rid of equalitarian individualism. They praised the universal suffrage and claimed the popular legitimation of the supreme authority. In the origin of one of the unusual coups d’état (Louis Napoléon Bonaparte in December 1851) held in Europe (all of them were unsuccessful in Germany and in Russia), this sort of nationalism was nurtured by the anarchism of French society. This dialectics of order and disorder, associated to a long-time illiteracy, has also given birth to a very peculiar nationalism: Sicilian Mafia, Neapolitan Camorra, and Calabrian N’drangheta. As for anarcho-socialism, shaped on the ideals of Revolution, it has suffered different fates. The Spanish statement «neither God nor master» has led to the creation of anarchist trade-unionism, which for a long time dominated the working class. In France, the antistatist left, very much present in the capital and its area, influenced the CGT of the beginning of the century. But in the years from 1920 to 1930, this had to come to terms with the other French groups. On the other side of the Alps, Piedmont and Lombardy celebrated the working class autonomy, the spontaneous action of the masses... until the First World War, when they were disciplined by the authoritarian socialism of central Italy. Dominated by France, this Europe of freedom and equality has contributed birth control (practised in France since 1750) and universal suffrage to her partners. The construction of the Community does not scare her, as she considers it even a modest goal, since it is just a fragment of the universal man. On the contrary, she has difficulty in admitting differences, and becomes willingly unpleasant to her partners by her «aggressive universalism». The German world (Germany, Austria, German-speaking Switzerland) and its surroundings (Alsace, South-eastern Netherlands, Southern Denmark), most of Northern Scandinavia, a Celtic block (Wales, Cornwall, North-west England, Western Scotland, Ireland, Breton-speaking Brittany), Occitania and the Northern Iberian arch. 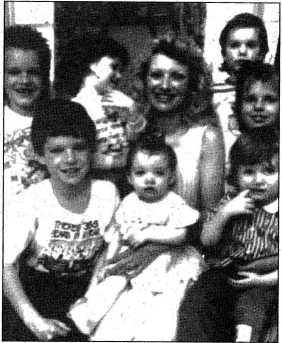 On reaching adulthood, only one of the children (the eldest, the youngest, or chosen by the father) marries and has children without leaving home. The other children have the choice to stay unmarried at home, or to go away to marry, to become priests or soldiers. These are indemnified with a money compensation. The cohabitation of two adult generations shows the authoritarianism of the system. The transmission of a great part of the resources to only one child and the more or less accepted celibacy of the others, show the inequality of the system. Authority and inequality. No frontispiece shows such an epitaph. However, the combination of these two values will be the origin of the great upheaval of the 16th century: the Reformation. 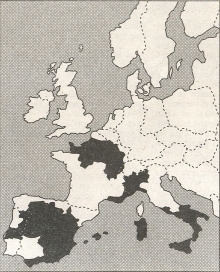 «The protestant predestination, the idea of an almighty God and of unequal men with respect to their salvation, has been accepted easily in the places where there pre-existed a family organisation including an authoritarian father and unequal brothers.» With the exception of Occitania and the north of the Iberian Peninsula, all the regions with trunk families have adopted Protestantism. Combined with a nationalist and dechristianized ideology, this ethics produced what Todd calls ethno-centrism (the defence occasionally aggressive of the ethnic group). In Germany this meant in practice the adoption of Pangermanism, and later Nazism. In small countries, such as Sweden and Switzerland, it assumed the form of neutralism. Finally, in the enclaved or in the peripheral areas it gave rise to regional movements. Irish, Welsh, Scots, West-Norwegians, Flemish, Walloons, Basques, Catalans, Galicians, Bretons, Auvernians..., with the exception of Corsica, the roll of the different movements and «liberation» fronts fits almost point by point to the peripheral introduction of trunk families. This social-democratic model spreads without any difficulty in Lutheran and Calvinistic countries. We find it almost unchanged in Stockholm, Vienna, Brussels and Berne. On the contrary, in the countries and regions where it is in contact with other family cultures, the party order gives way. In the Romansh area, militants pays their share less regularly and «a given verbal revolutionism betrays the influence of equalitarianism». In France appears the SFIO, the «hotpot socialism». Finally, as a reaction to the two preceding secular ideologies, the areas where faith had held its ground (the Catholic world in Germany) have produced the Christian Democracy. This movement rejects «radical state control» but demands the State action, a State under control of the church, to protect the rights of the weak. Mother of the Social Security, Germany has developed an original capitalistic model, neither savage nor individualistic. Her economic dynamism has never failed, on the contrary the evolution of society is slower. «Even merged together, Germany remains an aged country, calm, industrious. She does not get carried away, not even for Europe.» Only the enclosed regions of Europe are happy with the construction of the Union: they will be able to break away from the Nation State. Middle Italy (Emilia-Romagna, Umbria, Toscana), Finland. 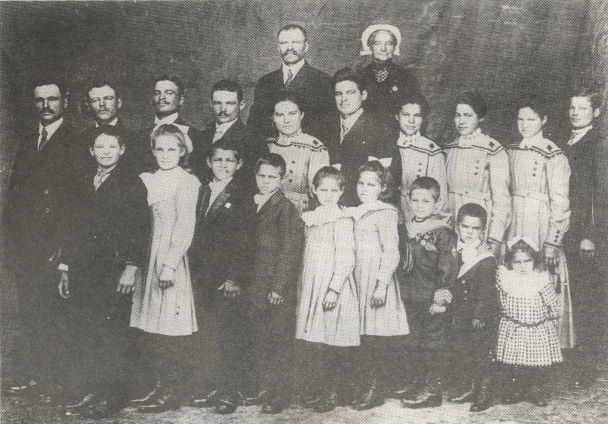 All the children can marry and take their spouses to the parents’ home. Rapidly, an extended structure is formed with the vertical cohabitation of three generations and horizontal cohabitation of two married brothers, under the authority of the patriarch. The sharing out of the property is equalitarian. This sort of family, probably the most common on earth, is rare in Western Europe. It prevails in Russia, Serbia, Bulgaria, Hungary, Albania, Mongolia, China, Vietnam, Northern India, but it is to be found only in some regions of the European Union. Open to all religions –Catholic in the South, Protestant in the North and Orthodox in the East– this family model is marked by the two ideologies produced after the end of the religious metaphysics: communism and fascism. The ideal cities, socialist or nationalist, are in the image of the family: authoritarian et equalitarian. Social democracy accepts a social heterogeneity (inequality among brothers) if controlled at all by a powerful state. Communism, on the contrary, strives after homogenization and tries to abolish class distinctions. At the other end of the political scene, fascism differs from Nazism. Both are very authoritarian, but fascism «is conditioned by equalitarianism», while the other tries to submit «unequal individuals». Mussolini’s nationalism does not sustain the inferiority of other peoples, and only at a later date introduced anti-Semitic measures. 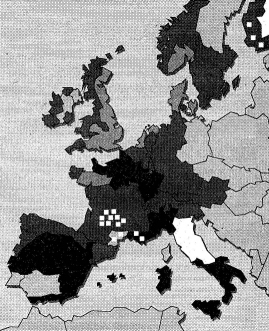 Central Italy has produced at the same time fascism and communism. The first one disappeared. The second one is still alive: Tuscans keep voting communist. Finland’s case is less clear. A fascist party had its time of glory, and in 1930 it even interdicted the communist party. But extreme right has always been a minority, while the left obtained as much as 40% of votes. Held in ignorance for centuries by the Catholic Counter-Reformation, central Italy has been kept in a relative underdevelopment. Today she takes off: the wealth created per inhabitant is one of the most important in Europe. It should get without difficulty into the regionalist model. 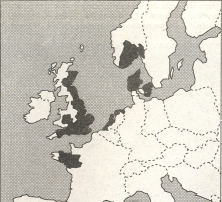 The Netherlands, Denmark, south and east of Great Britain, south-east Norway, north of Denmark, Le Maine and Anjou, Brittany. The young adult must very soon escape from the father’s authority. But unlike the equalitarian nuclear family, the father is free to share his properties as he wishes among his children through his will. It is an individualistic model, indifferent to the ideas of equality and inequality, and not given to family solidarity. Except Brittany (held within Catholicism manu militari), all the regions where the absolute nuclear families are dominant converted to Protestantism. However, under the influence of two theologians, Dutch Arminius and Danish Grundtvig, they reject priests, debate the dogma of predestination and reintroduce the ideal of free will, salvation through works. It is here that liberalism is born. Spinoza and Descartes flee to Holland in order to be able to write, while Voltaire wonders at the first parliamentary monarchy. Though feebly educated, England launches the industrial revolution. The Mayflower exports all of it to the USA. The religious backlash arrives later (end of 19th century) than in the Parisian area. However, it is more massive and leaves behind two typically British ideologies: labour and liberal-isolationism. On its side, nationalism is little aggressive. The English people do not consider themselves «neither leaders of a group of equivalent peoples (French model), nor the summit of a world hierarchy (German model)», and they fall back on themselves. Paradoxically, this isolation does not prevent the constitution of a vast colonial empire or the colonisation of the United States. The incomplete trunk family. Neither communal nor real trunk family. We find it in the area of contact of the Latin world and the Germanic world, and also between the France d’oil and the France d’oc. These areas unfortunately do not constitute an audacious synthesis. The only surprise is that in these areas we find the three headquarters of European institutions. The matriarchal family. Authority is exercised by the mother. We find it in the Iberian South-West and it would be at the origin of an atypical vote: over 40% goes to the communist party. The patrilineal family with an endogamic residue. A barbarism to mean that the Corsican family is very near to the Arab model, excluding marriage between cousins. Family is everything, the State is nothing. The clans invade the State to prevent it from developing. Corsica was the only failure of the Jacobin state. It showed up in 1975 by being a failure at the census. In short: the culture of the four European families is still impregnating the continent. An authoritarian feature, «able to restrain the industrial retraction, to stabilize the party system and the love for the State» is still marking Germany, Austria, Switzerland and, with respect only to the political sphere, Italy and Sweden. A liberal feature, acting as a catalyst of especially rapid socio-professional or political evolutions, is still at work in Great Britain, in France, in Denmark, in Spain, in the Netherlands. We ask: can we seriously consider a lasting union of this ethnic bazaar? The attitude with respect to immigrants is an example of the difficulty of building a Europe of citizens. In the name of freedom and equality, France persists in the dogma of a necessary assimilation. The jus sanguinis and the jus soli are mixed up. A generous nationality code makes French 95% of the children born in France from foreign parents. In the country of order and hierarchy the only law is dictated by blood. 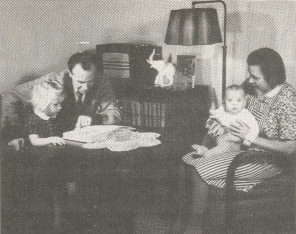 The German code grants that 95% of foreign children will remain foreign. Finally, English liberalism «navigates on sight, led by intermediate concepts». The respect for difference creates ghettos, individualism allows adaptations, mixed marriages, the source of undeniable individual success. Of course, all this is not serious. There is no reason to believe this thirty-nine year old, with a youngish face, who in the coming weeks will have on him the groups of anthropologists, geographers and historians. None at all, out of this: Emmanuel Todd has written La Chute Finale, a work in which he announced the decomposition of the Soviet system. This was... in 1976. © Libération. Access to original article in French language. Map of the family structure in Europe. Image: Francina Cortés. 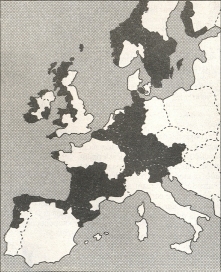 From the version of El Periódico de Catalunya. Monday, May 7th 1990. Page 26. 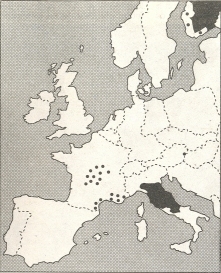 The family groups in Europe. Tradition in these areas (1500-1900): on being adult the children leave their parents home; when the parents die the assets are shared equitably. Values: freedom and equality. Ideologies: left: anarcho-socialism. Right: liberal-militarism. Tradition in these areas (1500-1900): one of the children stays with the father and increases the assets. The others have the choice to stay single in the family home or to marry away. Values: authority and inequality. Ideologies: left: social-democracy. 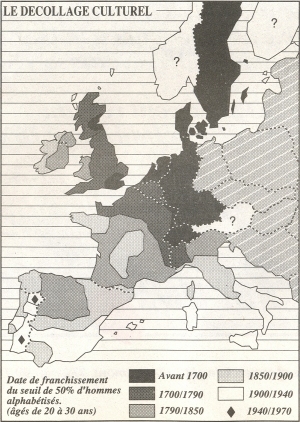 Right: pan-germanism, Nazism, neutralism. Tradition in these areas (1500-1900): children marry and stay in the family home; a patriarch rules over three generations working together, and in case of sharing, equity prevails. Values: authority and equality. Ideologies: left: communism. Right: fascism. Tradition in these areas (1500-1900): on being adult the children leave their parents home; share of assets is not equitable. Values: freedom and individualism. Ideologies: left: labourism. Right: liberal-isolationism. Drawing of the familiar diagrams: Francina Cortés. From the version of El Periódico de Catalunya. Cultural takeoff. Present day Portugal apparently has not yet gone beyond the literacy level of Sweden in the 18th century. Family structure determines the European structural differences, according to Todd. File image of the version of El Periódico de Catalunya. 1L'Invention de l'Europe (The Invention of Europe). Ed. Seuil. 540 pp. 195F.